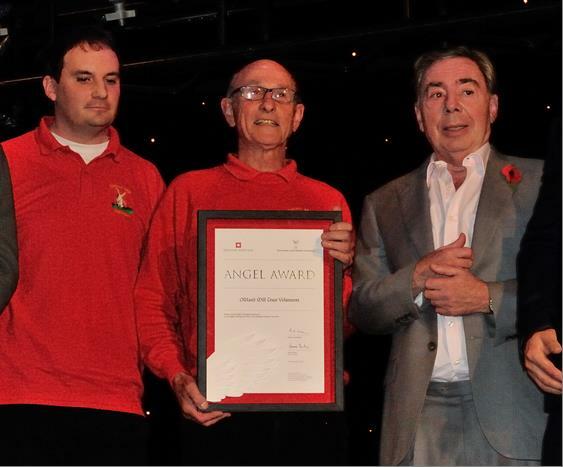 On Monday 3rd November, volunteers from Oldland Mill in Keymer near Hassocks West Sussex were voted the national “top of the pops” in the 2014 Angel Awards. To thunderous applause, they received the Award from Andrew Lloyd Webber, on behalf of English Heritage. Oldland Mill is the first windmill, and the first scheme in Sussex, to be honoured with an Angel Award. In the words of Andrew Lloyd Webber, this pays tribute to “the army of volunteers over many generations who made this possible”. Immediate past Chairman Fred Maillardet collected the award, with Technical Adviser Philip Hicks who has advised on the restoration work for over 20 years. Fred Maillardet said “teams of volunteers, well over a hundred of us, have worked for nearly 40 years first to save then to restore this magnificent working windmill. This award is a huge tribute to the success of all their efforts”. Oldland Mill was one of 4 nominees in the Best Restoration of an Industrial Building category. All four were worthy nominees, but unfortunately we were pipped at the post by a project at Howsham Mill which is located on the River Derwent in North Yorkshire. As well as the individual awards for each of the categories, there was also an award voted for by the UK public which enabled people to vote for any ONE project from the 16 nominees for the Ultimate Award. The volunteers of Oldland Mill were delighted when we were announced as winners of this award. If you voted for us, we thank you. The picture shows Philip Hicks and Fred Maillardet collecting the award from Andrew Lloyd Webber.